The College initiative provides a wonderful opportunity for our students to experience instrumental music as part of their academic program. While music is an integral part of College life, research has found that music can have a positive impact on enhancing a student’s learning experiences. Thus, learning an instrument has the potential to impact all aspects of a student’s intellectual and emotional intelligence that extends beyond the music curriculum and may impact on his capacity to achieve across all curriculum areas. 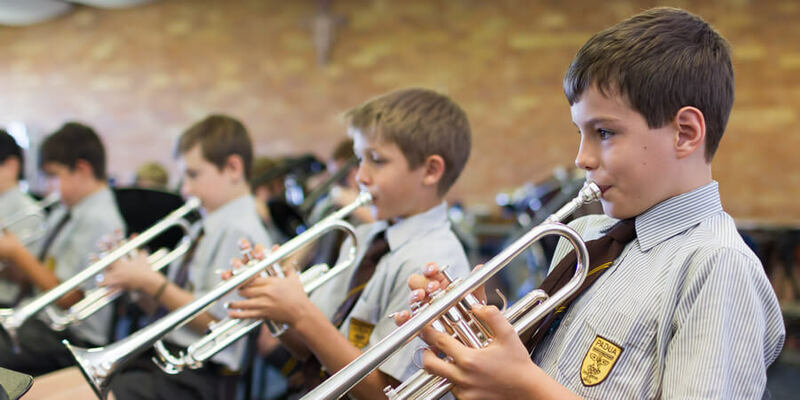 This program aligns with the Music requirements of the Australian Curriculum and provides a transition into the Year 6 Music program and the FCIP Instrumental Program for those wanting to take that direction. The Padua College Year 5 Music Program is a one year, in-class, program during which the student undertakes small group voice or instrumental tuition. Each student studies an instrument that is deemed, by our specialist music teachers, to be appropriate to the student’s ability and interests. As well as learning to play an instrument or develop vocal skills, the students learn to read music and to care for an instrument. The instrumental program teaches students the importance of time management and organisation with each student being required to include a regular practice routine into their homework program. Performances and participation in ensembles is a feature of this program. In line with Australian Curriculum objectives, students not only work in small groups, but also as part of larger ensembles and so engage in cooperative learning to create a musical experience is be “showcased” to the College community as opportunities arise. The Music Immersion Program is an exciting initiative of Padua College as it not only enhances a student’s musicianship and appreciation of music, but it may ultimately go beyond the classroom and contribute to their future academic success in other learning areas. At the end of Year 5, all students receive information about continuing to learn an instrument within the Franciscan College Music Program (FCIP) to further enhance his musical journey.